Tickets for Drum Corps International's spring cinema event, "The Countdown" officially went on sale today, Friday, March 28. 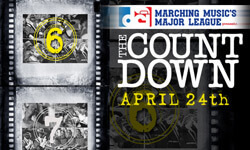 "The Countdown," which will feature the performances of the 2007 Blue Devils, 2007 Bluecoats, 2005 Cadets, 2007 Carolina Crown, 2006 Cavaliers, 2006 Phantom Regiment and other special features, will appear in more than 300 select movie theaters across the United States on Thursday, April 24. Tickets for this one-night-only event cost $10 and can be purchased through FathomEvents.com. Don't get left standing in the theater parking lot with your friends on April 24! Order your tickets early. Visit FathomEvents.com to locate a theater near you and purchase tickets.